Riot Games wanted us to help design their broadcast package, stage design and animations for the event at the Singapore Indoor Stadium. Hyperplay is the first integrated ASEAN e-sports and music festival, organised as part of an ongoing YOUTHx celebration, a government-driven initiative to celebrate diverse youth interests. The festival is jointly organised by Riot Games and MTV with sponsors such as National Youth Council, Singapore’s Ministry of Culture, Community and Youth, CLEAR Men as well as Singtel. The logo (pictured above) was all that was given to us when we were first tasked with the project. We wanted to tone things down a little and universalise the work - so we uncomplicated and simplified it, using the all-inclusive symbols throughout our project. We made the wise decision of using inanimate objects throughout our project - a good and bad thing. How were we going to tell stories with dead things, you ask? We used movements and embellishments to convey feelings of euphoria and sadness, drawing metaphors and parallels between the inanimate animation as well as the emotions in real life. What kind of software and techniques did you use? Adobe Suite - Photoshop, Illustrator, Animate. A mixture of motion graphics and 2D animation - frame by frame animation - was used. What improvements would you have made or lessons did you take away from this project? Communication between us and the client. There will always be room for miscommunication in any project. The magnitude and versatility of the work required of us resulted in road blocks along the way. Communication is always key. Creatively, we thought we could have incorporated more elements and play around with the layout. Pack more of a punch in general. In retrospect, we throughly enjoyed working on this project because we managed to rise above the challenges posed and presented quality work to the client. Just another day. Liked what you see? Share the link with your friends! Also, be the first to get content like this in the future, sign up for our newsletter below. Rachael: The client came to us looking for a video showing the new and improved Tomahawk B450 Motherboard, with all of its fresh and upgraded bits. We didn’t want to deviate too much from the actual product, and how it was assembled, which ultimately led us to the sequence of events/ order of revelations that our final video showed. Everything in the video, from the order of events to the details and colours all came with purpose and helped to emphasise the features of the new motherboard. 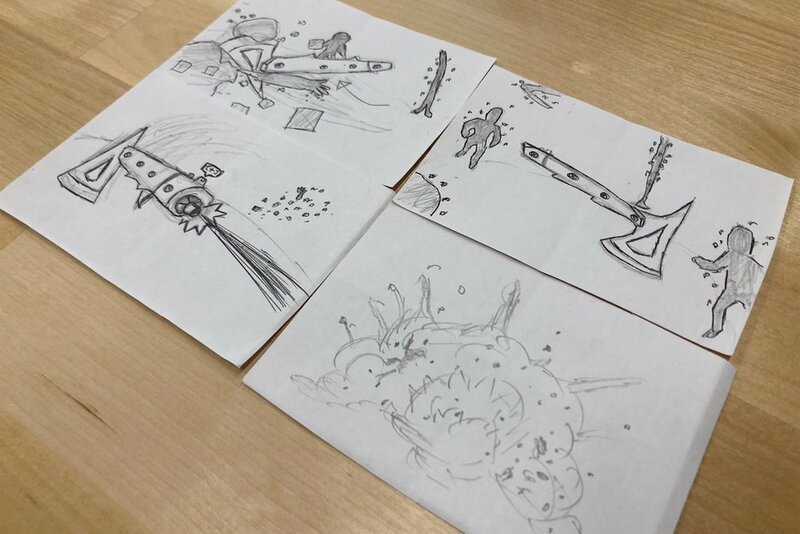 Rohan: We wanted to take on a more metaphorical and narrative approach towards the video with evil space pirates and flying tomahawks. But we realised later that that approach will distract the audiences from the product itself. Rachael: Yeah, Rohan came up with the idea of space pirates and although we did away with it, we kept the spaceship and used it as a “lead” within the final video. We wanted something that the viewers can follow, so using the spaceship to navigate through the products and motherboard was a perfect idea, considering the fact that we wanted the whole concept to be video game-ish too! Rohan:The spaceship also helped to give the viewers watching the video a sense of context. If not it will just be aimless floating, you know? When we were designing the spaceship we took inspiration from the MSI logo, the tail of the dragon. We offered up 2 variations of the spaceship, but went ahead with the other variation in the end. Rachael: We did a lot of research not only on motion graphics works but games as well, focusing on how we wanted to portray the motherboard. We knew that we wanted to do a stylised version of it, so from there we started looking for inspiration. Rohan: We settled on Ghost In The Shell and its projections, holograms and futuristic aesthetics as one of our main sources of inspiration. Using that we designed the motherboard. The client loved it so we locked that down and used the same direction for the rest of the video. Rachael: As mentioned before, we wanted to incorporate some gaming elements into the video since the product was made for streamers. The entire concept coupled with the spaceship worked out really well to meet our desire for a different user-interface art direction. Rohan: There was a lot of Cinema 4D and compositing. We used chromatic aberration together with glitches and distortions to add realism to the entire piece. Rachael: The distortion helped to keep consistency in the art style. The tunnel, for example, was done in 3D using Cinema 4D and After Effects. We layered over a lot of different effects on top of Trapcode Particular - which definitely played a big part in making the video. Rohan: We spent a lot of precious time waiting, because we had to render it from 3D followed by the compositing. We worked on this project with 3D artists from another studio, which meant that Rachael spent quite a bit of effort and time translating and communicating messages. Rachael: You’d think that designing is as straightforward as it gets. But no. We had to look at the work and anticipate problems that may arise from it, and solve it before it can cause us any trouble, haha. The glitches and distortion in the video also posed as a challenge as we didn’t want to add too much if not it would have looked messy - it was all about striking a good balance. During the start of the project when we were trying to figure out the sequence of events, we had to work within the limits of the product itself. 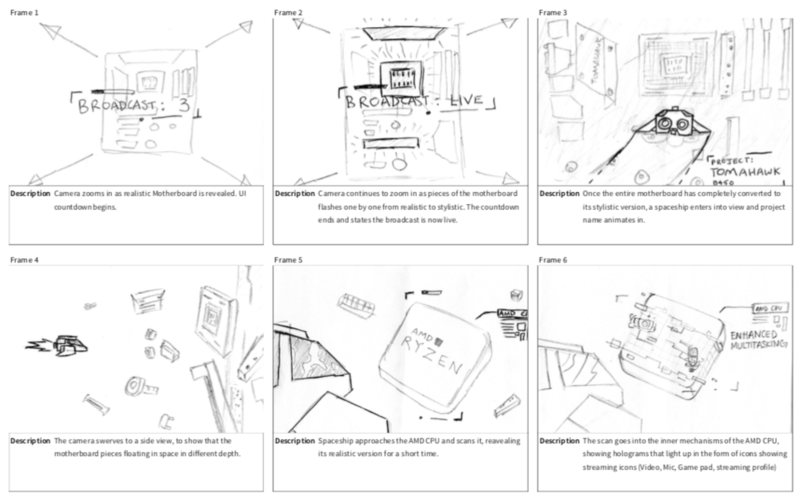 We took into account the nature of the product, figuring out the ones that can be featured and the ones that cannot be because at the end of the day, the video had to be realistic and also be an accurate representation of the motherboard. Rohan: Definitely the workflow. Looking back at it now, I would have reduced the polygon count which would have made the entire rendering process faster, which meant more time to perfect and better other elements within the video. Rachael: We definitely could have taken more time to play around with the composition of the visuals within the video. Maybe like what Ro said, adding details and polishing everything up because we could still push it further. Rohan: Yeah, things like the text, the motherboard at the start of the video and the highlighted features could use more detail, maybe through the use of accent colours etc. But everything is a learning process and its all about learning as you go and now we know! Rohan: I thought Rachael’s tunnel part was pretty sick and well-crafted. She may not have enjoyed doing it as much but at least I like looking at it, haha. Rachael: I think we both enjoyed the initial part of the project when we were experimenting with the visual aesthetics of the project. It’s always fun - well, for the most part of it. We hope you enjoyed reading about the process and took away a thing or two from this. It definitely was a journey from start to finish. Have you watched the video? If not, enter the Tomahawk B450 with us below! We know you guys have been wondering how we breathe life into ideas and immortalize them in a video. Read on and learn about the After Effects plug-ins that have helped us create our videos, the ones we cannot live without. P.S. we are not sponsored by any of these developers - we just want to share the good stuff. This package for motion graphics in After Effects boasts a set of 11 tools for 3D motion graphics and visual effects. From lights and glimmers, particle effects to 3D objects and surfaces, you can create beautiful and realistic results better and faster than before. We used Trapcode Particular in our Manifesto video adding the littlest detail to enhance the overall space scene. This plug-in is a lifesaver when it comes to animation. It helps to increase the workflow significantly, making our process a lot more efficient by helping us complete repetitive tasks. It also helps create energetic motion plus a whole bunch of other things. With over 20 tools available within the set, you can look forward to faster animation without the compromisation of work quality. As they say, “create more & click less”. Work smart and ease the creative process with motion 2, pictures from mtmograph below for some sneeks! If you’ve always wanted to pack a stronger punch in your videos, Frischluft is the way to go. It builds upon the existing effects and presets available in After Effects, enhancing them and improving them while still providing the freedom to customize. From blurs to glows to depth of field, this plug-in has them all. You can see how Frischluft helped bring our snake to life while it was slithering stealthily away in our Razer Mamba x Razer Hyperflux video! Are these plug-ins new to you? If so, send us the work that you’ve done using them, if not, shoot it our way too! DM us or drop us a message on our social media pages to share with us what you’ve done, we’d love to see them!